» A Truce in the War on Drugs? Part I. « Am I Prepared for College? 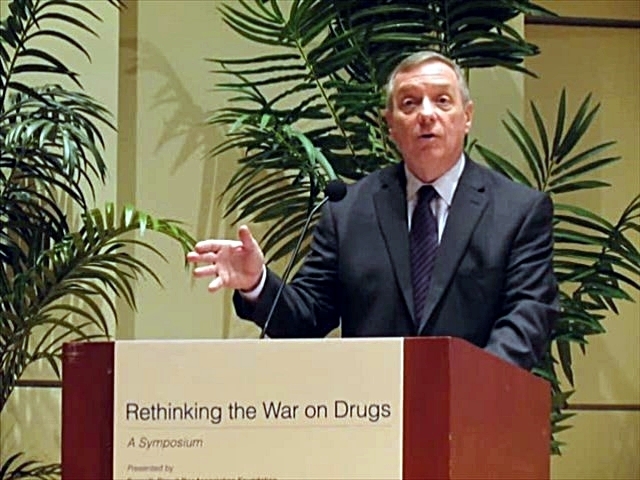 Additionally, Durbin said a new maximum-security prison has now been commissioned to be built in Thomson, Ill., to handle the current prison overcrowding situation in existing penitentiaries. Watch Durbin’s full speech on the Smarter Sentencing Act here: http://chicagodrugwar.info/?p=471. Federal Judge Ruben Castillo opines on changes needed to the nation’s drug laws. Photo by Mary C. Piemonte. In two exclusive interviews this year, in person and on the phone, in February and March, U.S. Chief Judge Ruben Castillo, the first Latino chief judge of the Northern District of Illinois – the third largest district in the United States – said the War on Drugs has been a failure. “I think we have to acknowledge that. Because the price of drugs has not changed over the course of 30 years. It also has resulted in the incarceration of many low-level nonviolent drug couriers. And so I really believe we have to rethink the War on Drugs. And I hope that the country will realize that we’re making fundamental mistakes,” he said after his speech after an event at Northwestern Law School on Feb. 20. “At first I didn’t think that way. But over time, I came to realize that. Probably about the 20-year mark, I started thinking that they’re different times. They’re too hard. And certainly, one-size-fits-all sentencing where you have minimum mandatory sentences – I think those are too hard,” he said during a phone interview. “I think most judges think that the sentencing laws right now in the United States are too hard…. We realize, not with every case, but with certain cases that they’re just too high. And so we need to be more individualized in sentencing people,” he said. “It’s a big sacrifice of human beings who end up in jail. It’s a big sacrifice in the American tax dollar that’s being used in a bone-headed way, which is not very cost effective,” he said. Federal Judge Sterling Johnson Jr. Photo by Mary C. Piemonte. 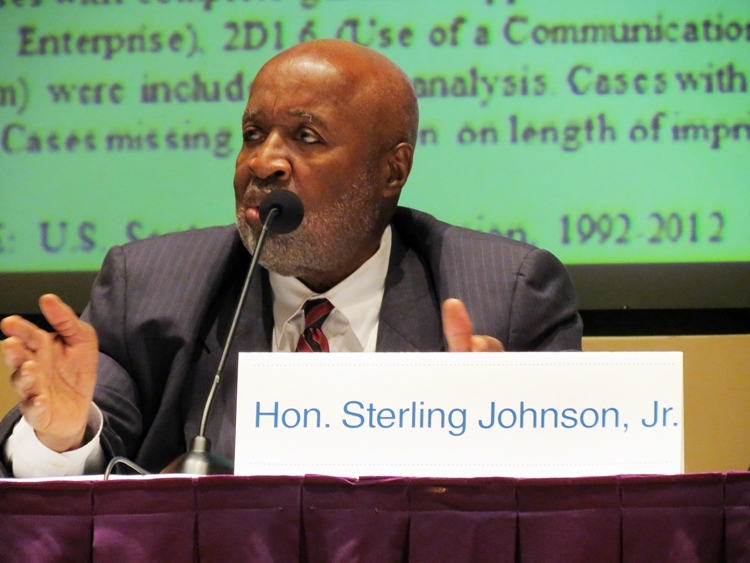 Some judges, like U.S. Judge Sterling Johnson Jr. from the Eastern District of New York, also feel that mandatory minimum sentencing of those charged with certain drug crimes has not slowed down or solved the epidemic of gang violence in drug trafficking in the underground economy. In a separate interview, Judge Johnson, also a former member of the U.S. Sentencing Commission, didn’t say whether he was for or against the War on Drugs. But he did say that mandatory minimum sentences under the old laws hasn’t really promoted any deterrence or rehabilitation for criminals convicted of drug-related offenses. 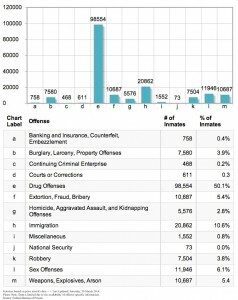 “[A]ll mandatory minimum sentences does is put people in jail and warehouse them. It’s a punitive stature. It’s not rehabilitation or anything else. Don’t fool yourself,” Johnson said. Judge Johnson, whose investigations as an undercover New York cop in the 1980s were the basis of the film “American Gangster,” added that people he sentenced under the old drug laws would have different sentences now and some wouldn’t have even gone to prison. Watch Judges Castillo and Johnson talking more about the U.S. 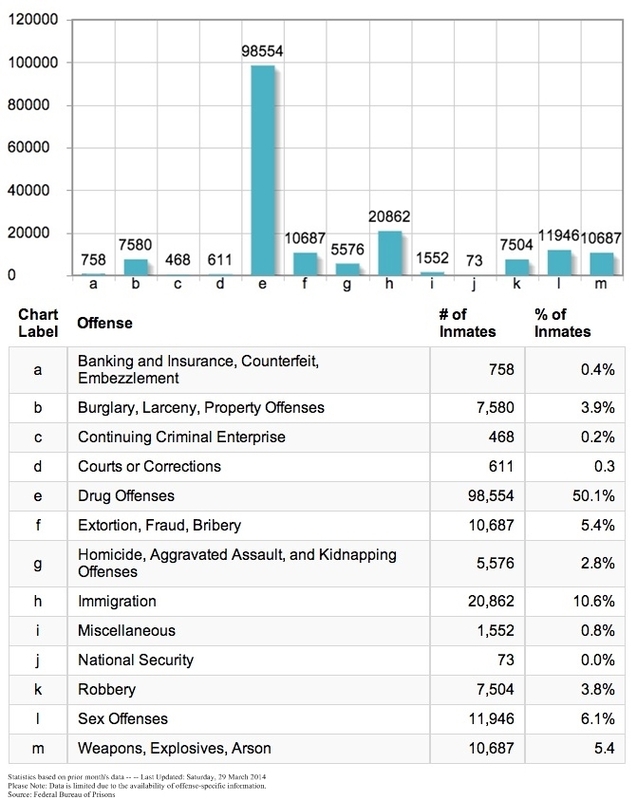 Sentencing Commission’s report on the drug war here http://chicagodrugwar.info/?p=463. State Sen. Kwame Raoul. Photo by Mary C. Piemonte. 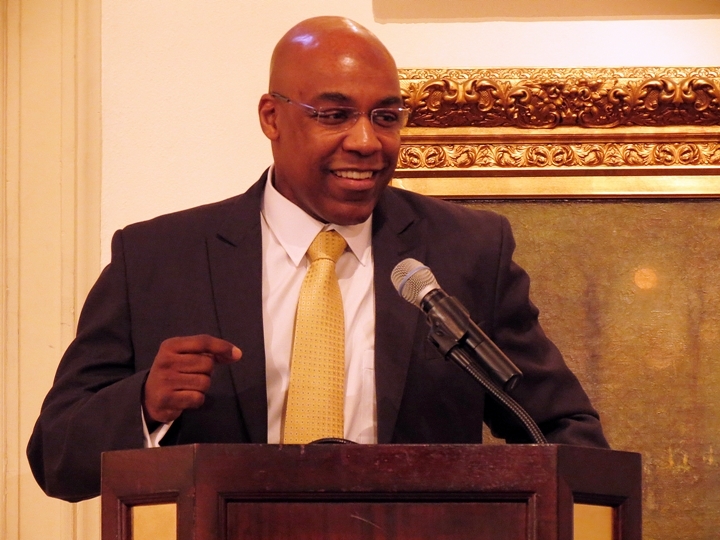 At a symposium on “Comprehensive Criminal Justice Reform” at the Union League Club in late March, Illinois Sen. Kwame Raoul (D-13) said he recently told his colleagues they should blame themselves for “failed tough on crime” policies that have led to the large prison population and fiscal challenges associated with the prison system. “We need strong voices to be able to say that we can’t continue allowing legislators and policy makers to ignore the better way to do things,” said Raoul. “If we get anything in our society right, it should be in the way we handle public safety, criminal prosecution, sentencing, rehabilitation and the return of ex-offenders to society so that they do not re-offend…in spite of significant progress, we’re still too often getting it wrong. “You can embrace evidence-based diversion and reentry programs and second-chance sealing and expungement policies without being soft on crime,” Raoul said. Raoul said the key to completing this structure is a “fundamental shift in policy makers’ thinking” about how to invest in public safety dollars. “Locking someone up in a cell is a quick, though expensive fix. “Lock the door, and that person is off the streets, for now. “They’ll have to come back. You will have to have a strategy for them. Raoul added that the case for being smart on crime, not just tough on crime, is one that must be made continually. Not just from lawmakers, but from community and business leaders, along with the general public. 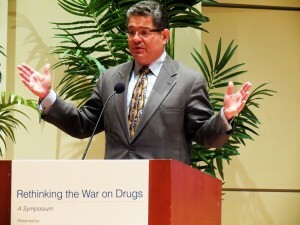 In an interview following his speech, Raoul said the War on Drugs had mixed results. “Obviously there have been some failed policies,” Raoul said. “There’s some laws on the books that are good laws with regards to drug use. I don’t want to use a broad brush and say all drug laws are bad laws. We do have a problem. Raoul said he has been a “consistent advocate” against the terrible situation in Cook County Jail where a large number of the inmates are detainees awaiting trial for years after being charged with low-level drug offenses. Watch Sen. Raoul framing the “$2 Billion Question” about whether the state can “improve public safety and spend less on incarceration,” during a symposium at the Union League Club of Chicago on March 31, 2014. http://chicagodrugwar.info/?p=568. This entry was posted	on Saturday, June 14th, 2014 at 6:03 am. You can follow any responses to this entry through the RSS 2.0 feed. You can leave a response, or trackback from your own site.